Migration is one of the most amazing feats performed by osprey with distances of 5,000 km or more from breeding to wintering territories. Tracking osprey is nothing new (scientists have tracked them for decades) but each spring and fall we feel the thrill of watching and learning from this species as it makes the long-distance migrations between the Northern and Southern Hemispheres. There are select non-migratory populations throughout the world that remain as residents in their region. They may move locally during the non-breeding season. Examples are osprey in Australia, Corsica, and Florida. 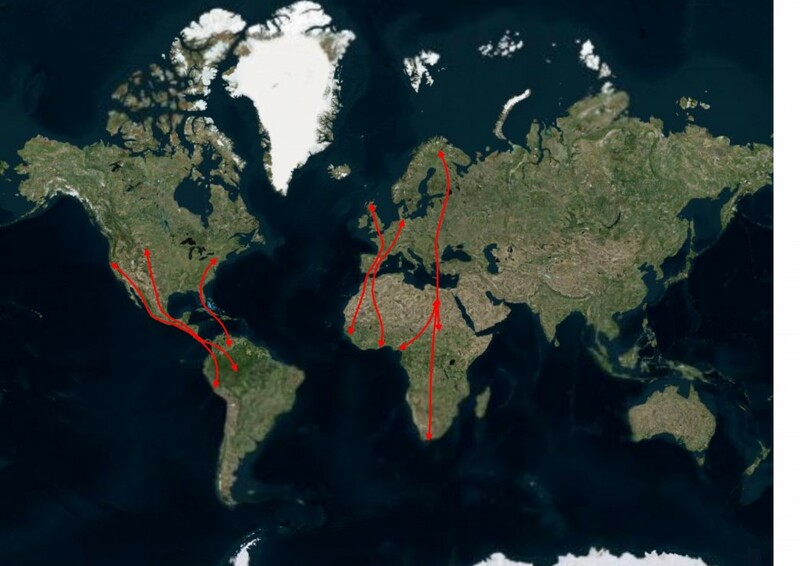 Known osprey migration paths from banding and tracking studies. Please visit these research websites for additional information on tracking osprey. If we’ve missed an osprey tracking project, please email osprey@osprey-watch.org and we can update this page with additional tracking projects.